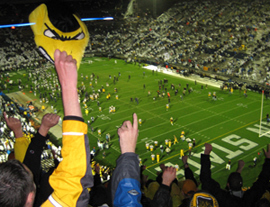 Hawkeye fans at Penn State. Iowa coach Kirk Ferentz says all Big Ten tackle Bryan Bulaga will return to the lineup when the Hawkeyes host Arkansas State on this weekend. The junior missed Iowa’s last three games and coach Kirk Ferentz says it was a thyroid condition that kept him out of the lineup. Ferentz says it was something that passes, and they had to go through a series of checks to see that he was okay. Riley Reiff started at left tackle the past three games and Ferentz says if all goes well in practice Bulaga will get the start. He says if there’s a player who is proven and they are out for medical reasons, then they get right back in when they are ready. Ferentz says if Bulaga is ready to go, he will start. Reiff is one of a number of freshmen who have played significant roles during Iowa’s 4-0 start. Ferentz says they’ve had a lot of guys step up, including the running backs and corners. He says it’s important for them to step up. Ferentz says the Hawkeyes did a good job of handling adversity in the victory at Penn State now he will find out how they handle success. Ferentz says it’s tough because they’ve gotten a lot of attention, but he says it’s time to turn the page and get ready for Saturday Ferentz says the Hawks will try to avoid a letdown that is all too common in college football. He says the won at Penn State and came back and had a down game at Purdue and were fortunate to win. The defense has led the way so far this season and Ferentz says that unit continues to make strides. Ferentz says the defensive effort was phenomenal against Penn State and the good news is they could have done better. He says they are playing hard and the guys up front are starting gell, and they are starting to look like a coherent group.